The Dog's Cojones: Influential Israeli rabbi says that God should kill the Palestinian people and their leader. It's no wonder the human species is fucked! Influential Israeli rabbi says that God should kill the Palestinian people and their leader. It's no wonder the human species is fucked! Right before the Middle East peace talks are set to begin next week, an influential Israeli rabbi (let's hope he's not 'too' influential!) has said that God (his god) should strike down the Palestinians and their leader with a plague. 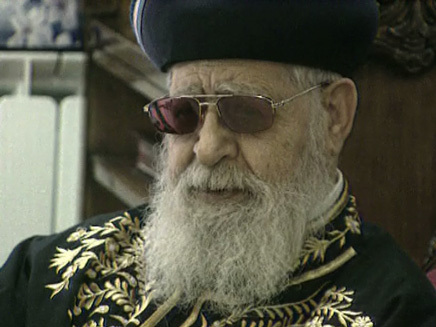 His name is Ovadia Yosef, he's 89 years old, and he's the spiritual head of the religious Shas party in Israel's government. "Abu Mazen [Palestinian President Mahmoud Abbas's popular name] and all these evil people should perish from this earth. God should strike them and these Palestinians - evil haters of Israel - with a plague." Apparently, the Iraqi-born cleric has made similar remarks before. During a Palestinian uprising in 2001, he called for the annihilation of the Arabs and said it was forbidden to be merciful to them. Fortunately, Prime Minister Benjamin Netanyahu has distanced himself from the comments and said that Israel wants to reach a peace deal with the Palestinians that would ensure good neighbourly relations. What a joke! I don't think that any of them know what the word 'peace' actually means. Saeb Erekat, the chief Palestinian negotiator, said that Yosef's latest comments were tantamount to calling for "genocide against Palestinians. The rabbi's remarks are an insult to all our efforts to advance the negotiations process." He's right ... but what negotiations is he talking about? I only see more and more innocent people dying on both sides.